If you are in need of a lot of protection and storage in a hurry, this high quality portable and temporary storage shed is your ideal solution. This Peak-Style Portable Shelter is perfect for storing and protecting your trucks, cars, boats, tractors, farm machinery, yard equipment or outdoor supplies. 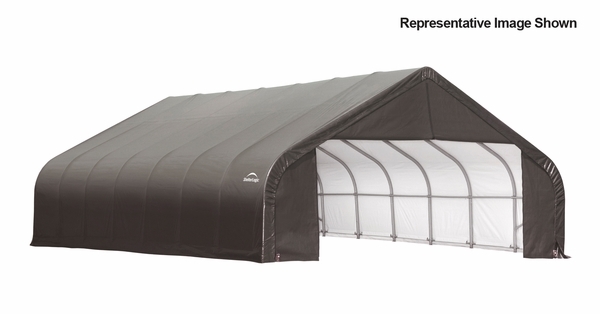 This super sturdy and durable shelter features Ratchet Tite technology to keep the poly cover smooth and tight over the frame. The entire shelter is firmly mounted with easy hook anchors. How long can I expect the cover to last in southern Ca where we get lots of sun and do you sell a replacement cover? Life expectancy of the cover depends on your local weather conditions. These covers usually last between 2-5 years. We do not offer the replacement top, but it is offered from Shelter Logic directly. There number is 860-945-6442. Does the height dimension refer to the peak height or the door opening height of this ShelterLogic 30 x 28 x 16 peak-style portable shelter? 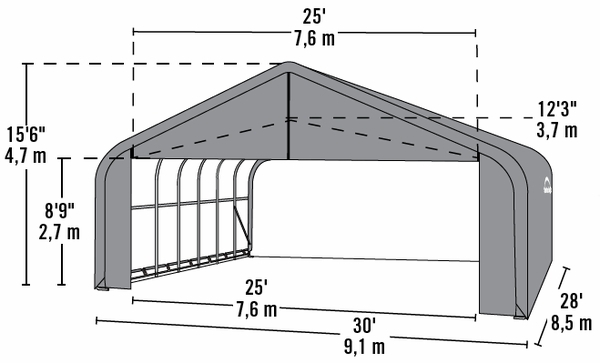 The ShelterLogic 30 x 28 x 16 Peak-Style Portable Shelter has a door opening height of 8'9" and a max opening of 12' 3".